Because it’s Cinco de Mayo and because I believe that every celebration goes hand-in-hand with a dessert…. I mean I made the batter, my Hubby fried the churros, I made the dip, we all devoured the crunchy sticks, licked the dip bowl and then licked our fingers. A crunchy, fried-pastry snack, coated with cinnamon sugar and dipped in chocolate. Golden on the outside and cake-like on the inside. Also called Spanish or Mexican doughnuts. What’s not to like? 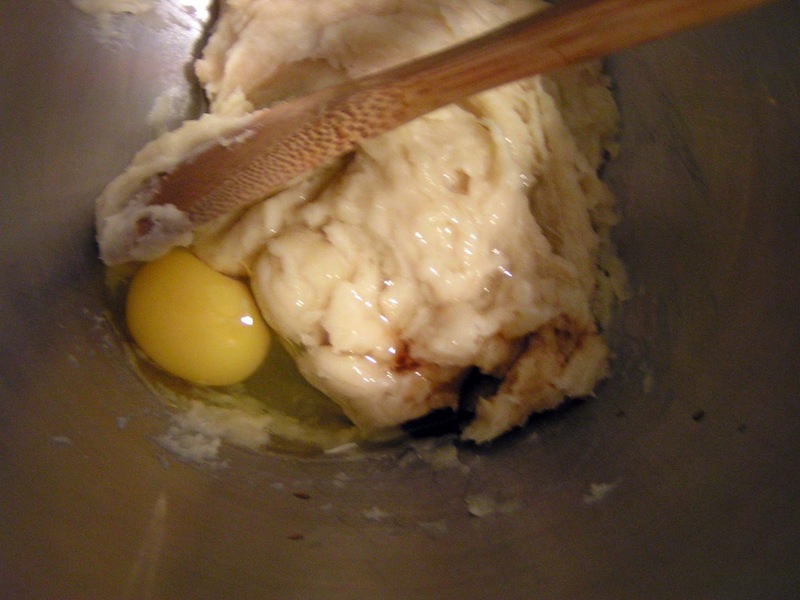 I tried several recipes, that would differ in the amount of eggs you add to the batter. The one that worked the best, uses only one. Traditionally, churros are made by piping the dough through churrera, but I used my trusty 1M tip, gently opened to make a large open star tip. When frying churros, use fork and very gently turn them to fry evenly. You do not want to disturb their shape. 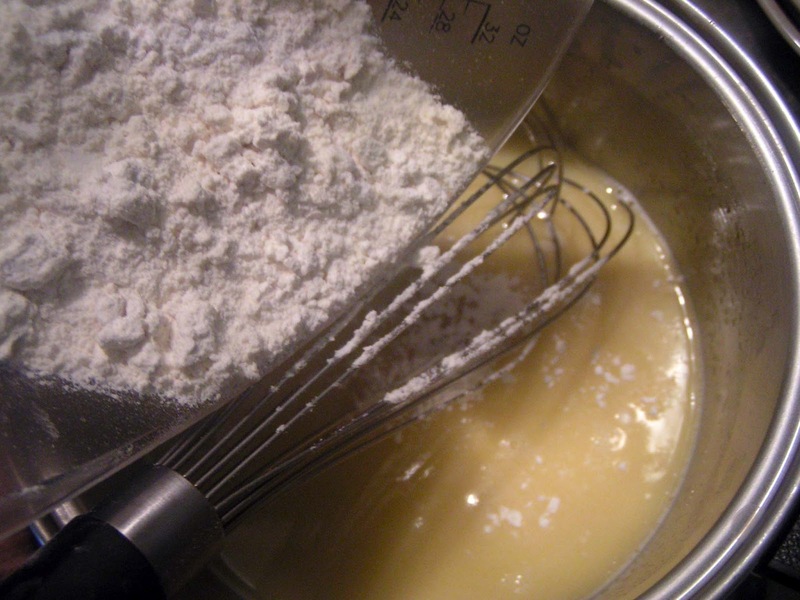 Combine water, milk, brown sugar and water in a medium saucepan. 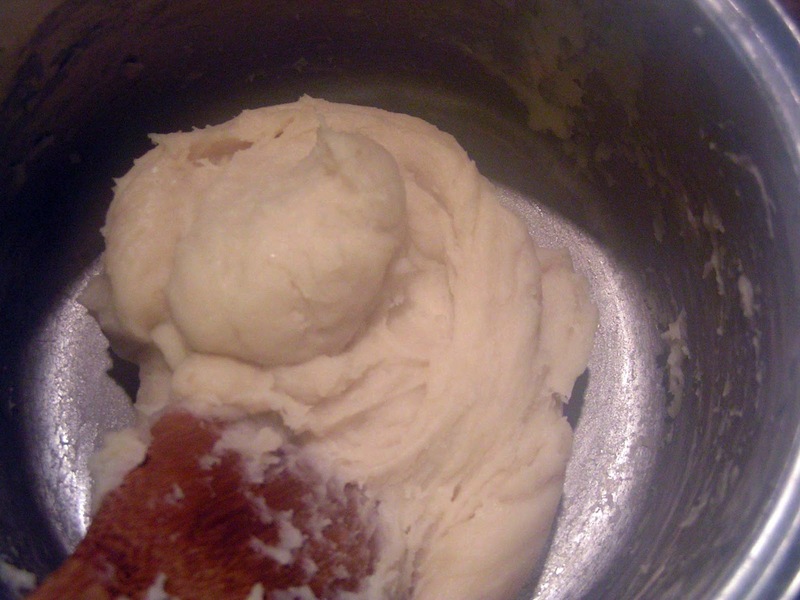 The dough should start to come together. 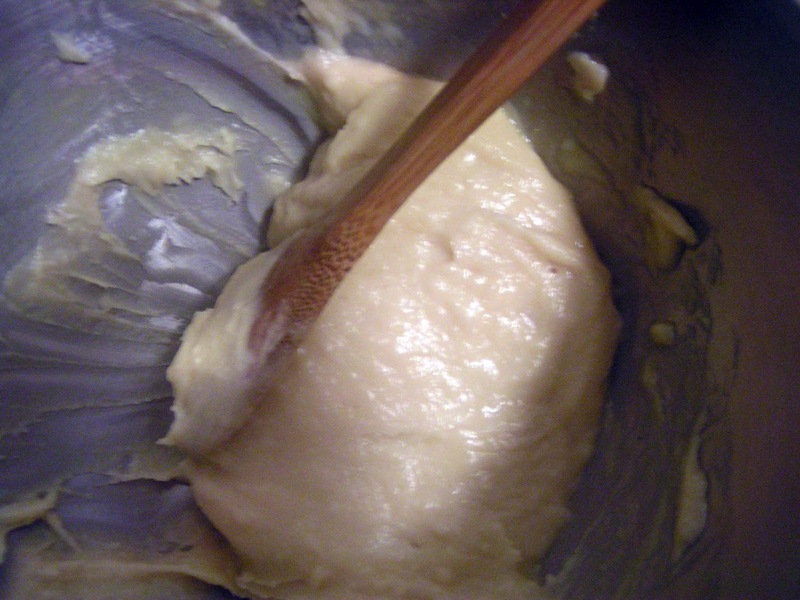 Switch to a wooden spoon and stir until the dough forms a ball and comes off the sides of the saucepan. It can take 2-3 minutes. Transfer the dough into a mixing bowl and let cool for about 10 minutes. Then add egg and vanilla extract. Mix until the egg is well incorporated. 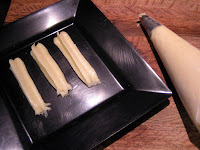 This is just an example of how the churros will look like piped, when your batter is the right consistency. There are recipes that use 3 or even 4 eggs, but you can end up with a runny mess that will just pour out of your piping bag. You want the batter to be thick enough to pipe churros with distinctive ridges. Pour enough oil into a pot, that it comes to 2,5 to 3″ up the sides. Heat it until it reaches 300 degrees. Pipe the churros straight into the hot oil. Be careful not to burn yourself! 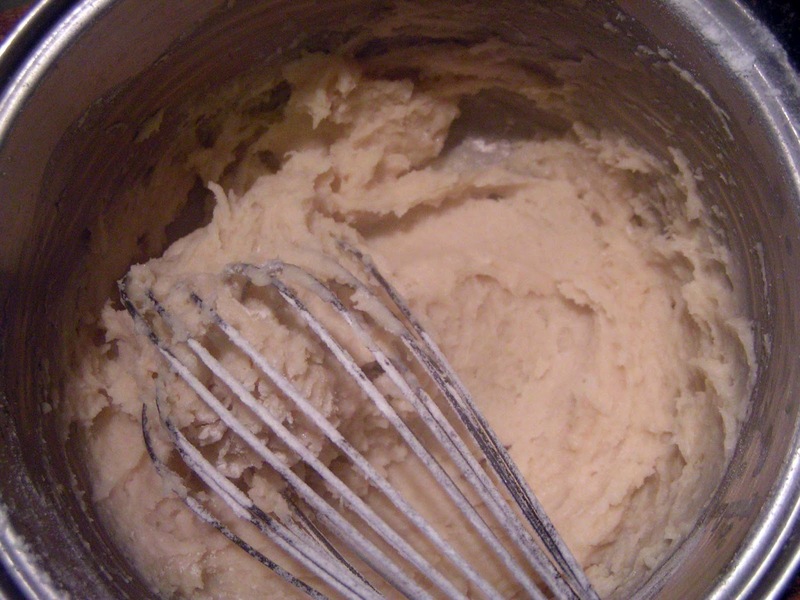 Gently turn with a fork to brown evenly. Transfer onto a paper towel-lined plate. Roll churro in cinnamon sugar. Serve warm, dipped in chocolate. Place the chocolate chips into a small bowl. Set aside. 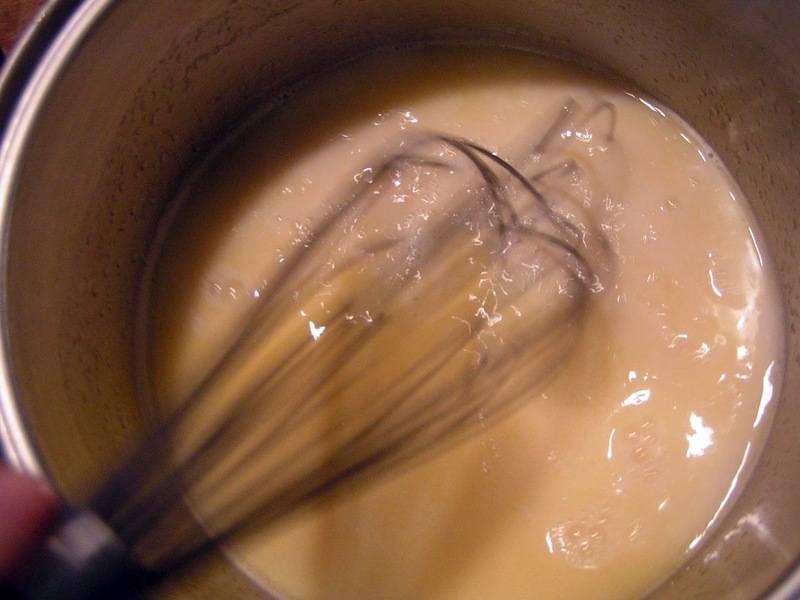 In a small saucepan, whisk together the yolk and cream. Heat to boiling, whisking constantly. Immediately pour over the chocolate chips. Let stand for 3 – 5 minutes. Heat the milk in the same saucepan and add to chocolate cream mixture. Sprinkle with cinnamon and whisk again. Let cool. Serve with churros. The dip will thicken as it cools. I hope you will have a fabulous weekend, filled with delicious Mexican dishes and desserts. Wish I can have those now . Yum! OMG! These look amazing. I wish I had them this weekend!!! I love churros. They are just so amazingly good. I tried to make some with my brother many years back and Im not sure what we did but they ending up exploding in the pan and shooting across the room. It was wild. But, your churros look perfect!!! When we made them the first time, we had few of them explode in the pan. The fix for that is to not try to reshape them once in the oil. Let them fry for few seconds and then gently turn so they brown evenly. Thank you, Beth Michelle! Congrats on the top 9! And those churros look perfect!! Awww, thank you so much, Yudith! Me encantan los churros rellenos con manjar o dulce de leche lucen muy lindos,aquí en Chile también son muy famosos ahora que ya hace frío,abrazos hugs,hugs. Thank you, Angie! So happy to be in the group with you! Hope you had a feliz cinco de mayo and congratulations on making the foodbuzz Top 9! Thank you so much, D B! Who wouldn't want deep fried dough???? And dipped in chocolate is even better 🙂 Happy Cinco de Mayo, Anna! Yummmm, we enjoy churros. What a lovely treat for today! Aww, thank you so much! It means a lot, Soni! oooh I love churros. Have to stop making them as I just gobble them up. Love the sound of the mexican chocolate too. Thank you, Laura! I saw your Pinata cookies – so adorable! Now that is a great recipe to showcase Cinco de Mayo. I love the originality of it! Very tasty! Thank you so much, Jeff! Welcome to CCS! Dang, I'll be right over. Save me a few dozen. Yes Ma'am! lol Thank you, Kim! I was just craving a churro the other night! I should totally make some now, no question about it! So happy to see you here, Ann! When it comes to churros and chocolate dip – there is no questions 🙂 Thank you! What a terrific snack. I haven't had a churro since I left the states. It's now the morning of May 5th (in Australia) and I think this would make a terrific addition to today's menu. Oh my goodness..We really should be neighbors so we could have a fiesta tomorrow! These look divine! I sent ya some buzz cuz you are buzz worthy! Have a great weekend! Yum! 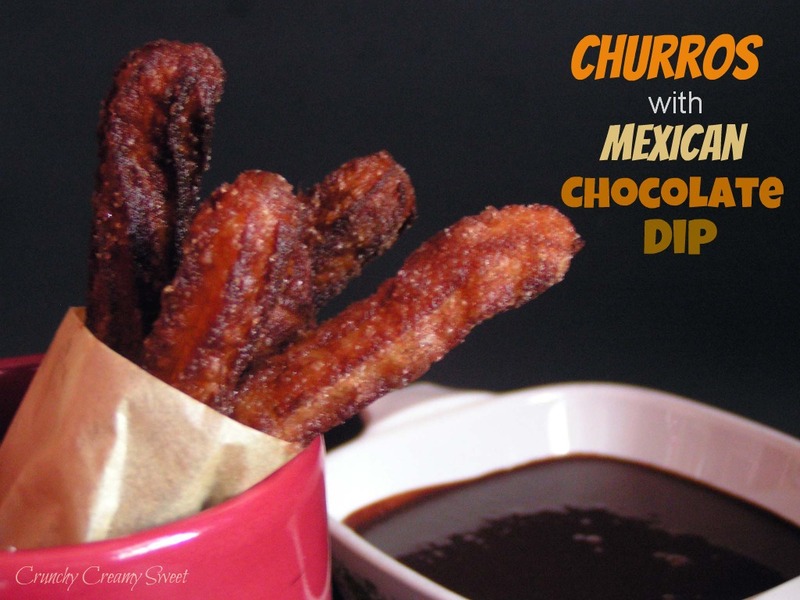 The chocolate dip is a perfect addition to churros! Oh yes! Thank you, Jessica! These sound fantastic! I love churros but have never attempted to make them myself. And I don't think I have ever had them dipped in chocolate–yummy! I love churros!! Yours looks amazing!! I bought some churro chocolate from Spain but I've never gotten round to making my own churros. omg YUM! sounds super delicious! Churros are so addictive! I am sure they would be gone in a flash at this house. Maybe even a fight for the last one. Yours looks so deliciously crisp on the outside-yum! Licked plates, licked fingers- that is the best indicator of how good these were. Delicious post and you have a wonderful weekend as well! Mmm, Churros! I should really get over my hatred of frying things. Maybe I just need to make peace with my tempermental stovetop? This all looks delicious. Happy Cinco! Hi Vicki! I say – go for it! 🙂 Thank you! These look really good. Just shared it on Pinterest! I hope that's okay! Please, do! Thank you so much, Deborah! Hi Anna =)) These look delicious!!! Wanted to let you know that I nominated you for another award package, lol … visit my Almond Mocha Roca Brownies Cakes post for the scoop 😉 Have a great weekend!!! Ahh, a fellow fryer 🙂 These are classic Cinco de Mayo and sound fannnnntastic! Love the dip that goes with them causer we all need dips! !